In the mid-to-late ’90s, teenage girls’ hormones were kicked into overdrive thanks to the pop chart dominance of groups like Backstreet Boys and N Sync.Oklahoma natives Hanson were often lumped in with those “boy bands” despite pre-dating them by a number of years.The group’s 1997 mega-hit “MMMBop” rocketed them to international fame. By the time Hanson’s major-label debut Middle Of Nowhere stormed the charts in 1997, the band had been writing and performing original music for five years. Fast-forward to today and with 16 million albums sold, Hanson is still very much a going concern. 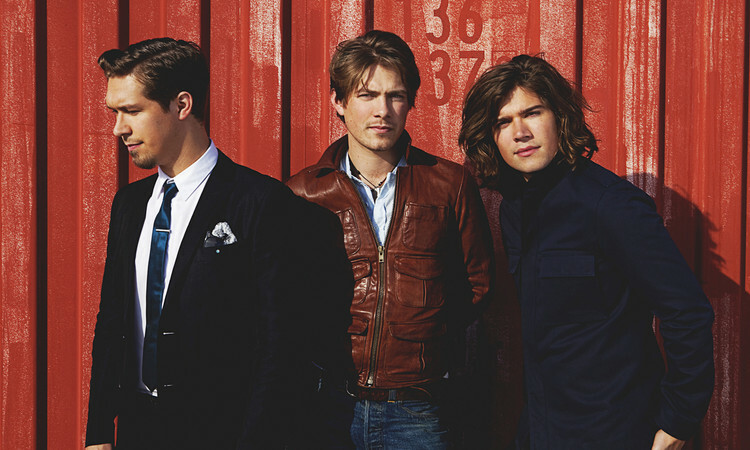 The trio of siblings that make up the group, Isaac, Taylor and Zac Hanson, stood out from many of the slick, manufactured pop bands by virtue of playing their own instruments. As far as Hanson drummer Zac Hanson is concerned, the group wasn’t trying to revolutionize music; they simply believed that was what groups were supposed to do. Playing in the band from the age of six, Zac says that his parents were always encouraging but never pushed any of them into making music. Because their father worked for an oil contractor, the Hanson family spent much time overseas with limited access to English-speaking music. The boys subsequently dove into their parents’ music collection, immersing themselves in the sounds of Motown along with classic American rock. Those influences naturally found their way into their original material. Practically no one could have predicted the success that Hanson would meet with in the late ’90s. Looking back upon the hysteria that surrounded the group with the international release of “MMMBop,” Zac says that the whole experience was surreal to say the least. “Playing music is something that has really been a way of life for me, from the time we played our first shows,” he says. “Needless to say, when ‘MMMBop’ was taking off, it was the first time that any of us had experienced any kind of hysteria around our music. “Looking back, we were lucky that we had years of experience behind us when the group took off. We were used to needing to win over crowds with our shows. Suddenly, thousands of people are showing up for our mall appearances. It blew our minds — we just couldn’t fathom it. The first time that happened, we had 3,000 people show up at a mall event where organizers were originally anticipating maybe 50 people. “The first thing we thought about the size of the crowd was that Sears must be having a heck of sale,” Zac says before acknowledging the group was prepared for life in the music business to be a series of ups and downs. Although Hanson undoubtedly benefited from their affiliation with a major record label at the turn of the century, the group has been fiercely independent since promotional efforts behind 2000’s This Time Around wrapped up, Zac says that having the opportunity to have complete control over everything from how the group is marketed to the direction they want to take with their music has been of critical importance. The band’s latest record, Anthem, was released this past June. Zac says that, for a variety of reasons, the record was one of the toughest they have made. “We had done a lot of work behind (2010’s) Shout It Out and just dove straight into the process of planning this new record with plans for video projects among other things,” he shares. “It is those things that do not serve to fuel the creative process and was forcing the music to take a back seat. When: Sunday Nov. 17, 8:00 p.m.